Released originally in 2013, The Inner World is a classic point and click style adventure in a fantastical imaginary world seemingly backwards from ours, with a vast expanse of earth surrounding a small space in which the Asposians live. Once they celebrated the winds, that came from tunnels outside their world, but as time went on the winds died down. Ferocious monsters came from the wells, terrorizing the populace and petrifying it's citizens. With a sequel dropped recently in 2017 and a new audience in the Switch, both titles have made their way to the hybrid console. In The Inner World, you play as Robert, a lowly musician in one of the Wind Monasteries. As a servant to the Wind Monk Conroy, your life is rather bland, until a few chance happenings cause Robert to head out on his own. He learns that the monsters aren't exactly what they seem, and neither is Conroy....or himself. The game plays out as a traditional point and click puzzler, albeit in it's own unique universe. For me, The Inner World relies on a system of logic even further out than your Monkey Island series, and that's saying quite a lot. One of the curses of doing reviews and getting them out in a timely fashion is that you have to get through them quickly, so I did end up utilizing a walkthrough for a portion of the game. I did my best to find answers "logically" through the game to understand why things worked the way they did, but there are a lot of head-scratchers, like realizing the only way into a secret room is by baking a cookie shaped like a key out of random powder you find around the building that falls down when someone sings a song....yeah. I did resort to using the hint system a few times, which nudges you in the right direction. The solutions, while obtuse, tend to be rather hilarious, but an impatient player may get frustrated at dealing with the randomness, backtracking, and reliance on hints. My biggest problem with the game revolves around the interface. Point-And-Click style adventures rely on, well, pointing, something that The Inner World fails in. On the Switch, interfacing with items in the world requires you to hit a button, which brings up all the nearby things you can interface with. You then have to cycle through the options, which at times seems to be rather random, bouncing around the screen. Also, a few interfaces can get frustrating, as complexity is added to some simple moves, such as climbing stairs in a particular puzzle requires you to interface with each step as you go up. Adding all of that to the obtuse puzzles can be frustrating simply because you might finally figure out the puzzle only to struggle with getting there. Also, the game does not offer any different interface when undocked, when the touchscreen would be obviously accessible. Handheld or big screen, you have to deal with the frustrating interface, when touchscreen has existed within the mobile edition of the game. The humor involved is worth it, though, as the wit in the script is humorous and worth the frustrations. Luckily, The Inner World has a sequel that has cleared up the control issues. 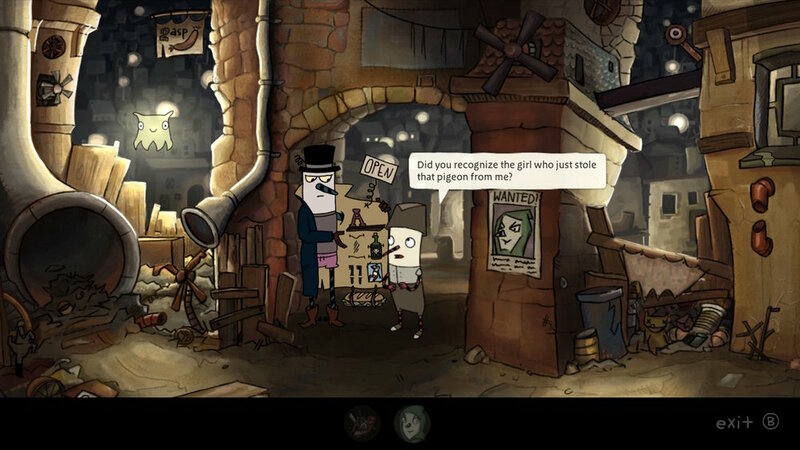 While the original selection option still exists for on-screen play, off-screen offers touchscreen support. There are plenty of good (and bad) issues to discuss regarding The Inner World: The Last Wind Monk, but that's a review for another article. Check it out here! 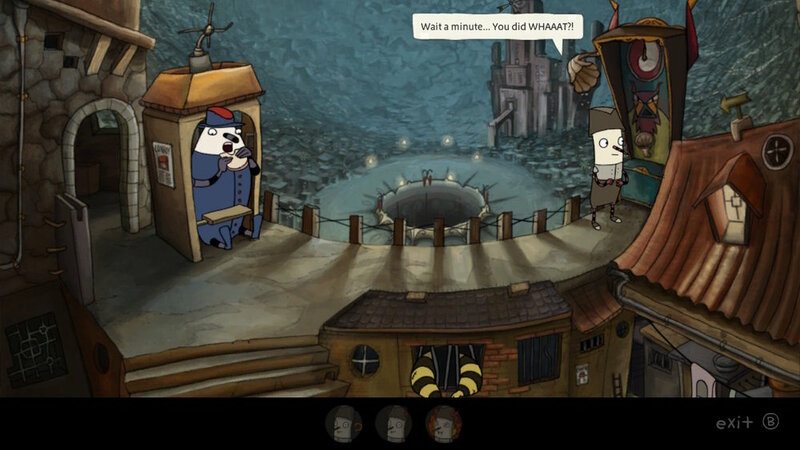 In terms of point-and-click adventures, The Inner World is a modern masterpiece, filling that desire for wacky combinations of items to get unpredictable but positive results. I'm not sure why the two titles, which were released for the Switch day-and-date together, have different interfaces, but I'm hoping a future update could bring the sequel's interface into the original. The games are sold individually, so instead of having a full-price bundle you can test drive a single game without breaking the bank. Let it be known, though, that while so far I've found the sequel superior, the plot immediately follows the prior game and spoils the heck out of the ending. If you 100% intend to only ever play one game in the series, go for the second, but if you wish to see all Asposia has to offer, don't skip the first game. Special thanks to Headup Games and Studio Fizbin for providing a download code for The Inner World (and it's sequel review, coming soon! ).